Obey YOUR Leaders: But Who Are Your Leaders? I have posted a couple of posts about this. But reading it again I think there is something that I missed. The subject is “your leaders”. You see today, we have men who call themselves leaders. This leads to a genuine question. Exactly how is leadership established in the local church, and who MUST a Christian submit to and obey? I think this is where it gets muddy. So I am going to write what I think and I would love the interaction of others who have wrestled with this. Exactly who does other believers have to submit to and on what basis should they submit. What constitutes a leader? How do I know if this person is really a leader and I should be submitting to them? What if I don’t want to submit to them? When should I not submit to them? Am I free to ignore them? Would I be in sin if I don’t submit to someone who I don’t believe I should submit to? These are serious questions and questions I don’t know if we ever really consider. Paul (??) is writing this Church about brotherly love. The first imperative is to “let brotherly love continue”. Next he goes to a personal application of what this brotherly love would look like. One is “remembering” those who spoke the word to them. If my assumption is right, to “speak” the word may have put their lives in danger. Given the fact that the reason this letter was written was to encourage wavering ethnic Jews from running back to the Old Covenant because of severe persecution. This is why Paul reminds them that Christ went outside of the camp and bore shame and they were to also go outside. Given the fact that these leaders had served them even in the face of death wouldn’t it be expected that they would follow their service and not make ministering to them difficult. They had proven that they were worth following not by mere position and not by being in authority, but by risking their very lives to preach the Gospel to them. Many had lost homes and jobs, but instead of shrinking away they were empowered by the Spirit to preach the word even as death stared them in the face. Let them do this with joy and not with groaning, for that would be of no advantage to you. Why make ministering any more difficult than it was? I think one way of making it difficult was that they were begining to question them about Jesus’ ministry and the validity of the Gospel. They started to question if Jesus was really enough, which Paul explains quite clearly from Chapters 1-10. Many of these leaders had seen the gathering shrink (Heb 10:25) due to this questioning and persecution. So Paul admonishes them not to forsake the gathering (this isn’t church membership and tithing folks). They were probably hearing “if Jesus isn’t sufficient then why should we meet”. So in closing, this is the type of example that is to be followed. These men stared death in the face and is spite of losing it all they continued to preach the wonderful sufficiency of the Lord Jesus. So this is relational, example like, servant leadership. Not men who have went to school and have been transplanted. Not men who have been accepted by a theological party, but men on their own initiative who would minister the Gospel regardless of the risk, most likely for FREE not at a salary package, not if you could only offer them enough money, not for gain! Those who had come to know Jesus were questioning them and began to make ministry hard for them. They may had begun to reconsider theri faith (this is why there are so many warnings in this book, warnings about falling away) so Paul encourages them by rebuking the Church and telling them to go outside the camp where Jesus bears the shame of sin! Not the safety of the Old Covenant that was powerless, obsolete and left void by God. To turn back meant nothing, to turn back was to be like Israel in Numbers 14, to turn back was to turn away from the very God that they say they wanted. No turning away wasn’t the option and these leaders most likely fought with them and reasoned with them and labored among them to show them the truth of Jesus Christ and the recipients of this letter had begun to ignore them. 25 But Jesus called them to him and said, “You know that the rulers of the Gentiles lord it over them, and their great ones exercise authority over them. 26 It shall not be so among you. In the ESV I don’t why they translate the word differently it is the same word “katakyrieuō” which means “to bring under one’s power, to subject one’s self, to subdue, master”. Peter repeats the exact phrase that Jesus told him back when He was talking about the greatness, servant, Kingdom stuff. So the question is this. As leaders, how are we to get people to do what we think they should be doing? I guess this could be a two-fold discussion not that I am writing this. The first being how do we get people to obey God, the other is how do we get people to submit to our ideas? Wow, this could be a scary discussion. I guess I now have a third question. Should we expect people to submit to our ideas and if so which ideas? If anyone is up for that discussion, we can open up a floodgate of opinions on that I believe. Anyway, back to the original program. Calvin who constructed this LEADERSHIP acrostic (I just added my flavor to it) loves pictures and illustrations. I believe he was on the money on this one (he usually is on 99% of the stuff). As we read this one chapter letter/book we are mesmerized by Paul’s writing style. He spends the first few verses encouraging and even praising Philemon for his work in the ministry, he then, with great agility, cuts to the left and says “accordingly… I could command you”. I wonder what Philemon is thinking when he reads this sentence. I bet his smile, turn into a deep curiosity of what he could be commanded to do. Then Paul says “however I appeal to you”. It is funny that Paul uses the word love three times in 8 verses, not to mention words like joy, comfort and refreshment to open Philemon’s heart. This type of communication can only come from a seasoned leader who is full of wisdom I suppose. 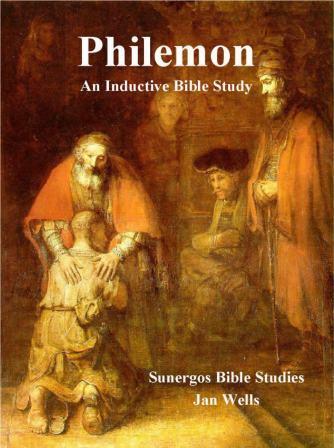 So Paul appeals to Philemon for what? The words that follow must have hit like a ton of bricks dropped from a 200 story building. He says “my son Onesimus”. We get from the letter that Onesimus was a slave (yes a slave Chuck), of Philemon, how he became a slave is not important for this discussion and we can only speculate anyway. We also get that Onesimus ran away and most likely stole from Philemon (Paul promises Philemon that he would repay him) on the way out the door (these equate to a pretty bad beat down if not Capital Punishment under Roman Law). So Paul appeals to Philemon not to just forgive Onesimus (and not have him punished or killed) but to accept him as a brother in the Lord and a co-laborer with the Apostle. Just think about it, Onesimus is sitting beside Paul as he is writing this letter and Paul tells Onesimus “you must go back and reconcile this issue”. Even if Onesimus has great confidence in Paul there has to be so level of fear that Philemon may “backslide”reject Paul’s appeal and have Onesimus punished. Think about the slaves who saw Onesimus knocking on the door. What about those who were eating dinner over Philemon’s home. What about the neighbors, who hear the rumors of Onesimus fleeing. This was risky and as dangerous as a mine field and Paul says “I appeal to you”, when he could have commanded such a thing. So what does this say to us as leaders. As Peter and Jesus says “we are not to be lords over one another”. Our method of dealing with things should be to appeal. In our top heavy churches this could be hard to put in practice. Mostly when leadership wants something done they command it, unlike Paul. Verses such as Hebrews 13:17 are quoted. Some of our heavy handed and authoritarian brothers take it a bit further ( I was in a church like this). We were taught not to question and “lording it over” was an understatement. The picture of a biblical leader and the way we deal with differences is to “appeal”. Never to lord, never to manipulate (it is funny when something needs to be built or purchased the manipulation method that is used). As a matter of fact I believe the latter (manipulation) is the more common method today. When funds are low, bring up some verses to manipulate, when we want people to buy into the vision, we manipulate. I believe the lording over may be more of an extreme pentecostal method, but none the less neither method is the way biblical leaders are to get things done. I would add this (but will not teach this in my local assembly). I believe this method of appeal is to be used to generate consensus on all decisions in the local body. I guess I would be considered a big congregationalist with this perspective. But I believe that consensus is the the biblical model on making decisions in the local church. Even with plurality of elders or with the senior pastor/deacon model, appealing is not necessary. Why? Because the people have no say in the day to day business of the church and even if they do the “board” has full veto power. I don’t agree with this one bit. Each member of the local body has 100% stake in every decision. It is funny that most of decisions that are made are never made by the church, it is made behind closed door and if you disagree you can either deal with it or find another church regardless of the sacrifices you made to see this local assembly flourish and that is sad to me. However that goes back to the every member church, which I believe to be rare to nonexistent today. In closing lets appeal like our brother Paul. We are not be lords but fellow brothers, and our example (1 Peter 5) should be what allows our other brothers and sisters to willing submit themselves to us. If it is done with a lording over mentality I promise you your decision, regardless of how beneficial it is, is not of God, it is not Holy Spirit driven but man centered and worldly. He then goes on a few verses later and says “like a father with his children”. Let me say if we get this wrong we get everything about the leadership Jesus talks about wrong. Jesus slept, ate, prayed, traveled with His disciples, even to the point of washing their feet. But if the quote above by Jon Zens is correct we see something that is the polar opposite and it dominates our churches. Let me tell you why this happens. Religious Education, Church Offices, Pulpits, Hierarchical Structures, and the professionalization of the “pastorate” contributes greatly to this if it is not 99% of the reason this exists. As long as I am a Shepherd over Sheep versus a Shepherdly Sheep this problem will never cease. As long as I am identified by titles (reverend, pastor, minister, elder, deacon or the wacky ones such as bishop, apostle, superintendent, prophet or the like) instead of relationships I will never be deemed “the mature among equals” but I will consistently perpetuate a chasm that never narrows. As Paul meets with the Elders in Ephesus (Acts 20) and he tells them that he would never see them again, you get one clear picture. They loved this man. They hug and kiss him and then they weep. We will fire a pastor if he isn’t performing (bringing in revenue in the name of people). Paul uses two of the most intimate familial relationships to express his love to the whole church in Thessolonica. We can’t miss this. If your leadership is defined by a title, position or function instead of your relationship to people you are no different than the way the Gentiles functioned. This is well to common in our churches and passes by with little to no scrutiny. How would Timothy and Titus know who were the mature believers to select as elders? The people would have known and would have been following these people. Remember elders came post church plant not pre church plant. I think we read our 21st century mentality into much of this. Timothy and Titus was SENT to ordain Elders in churches that had people functioning as elders. Notice they didn’t go to “make” elders Timothy and Titus didn’t bring guys they knew to function as the leaders of those congregations they elected them from among the people. People who were already functioning at the level Paul had described in 1 Timothy 3 and Titus 1. And these things would have been impossible without relationship. The people in Ephesus and Crete would have had intimate details about their lives. They would have played with their kids, ate each others food, worked beside them, and served with them. They would have saw the good, bad and the ugly and would have been able to trust them as they both grew and functioned in their giftedness. They would have known that these men loved them and cared for them, because they would have already been doing it. Listen, we can functions as leaders in a “church” I can begin working on my seminary degree and immediately walk into a church and be appointed some type of intern “position”. I may do well, but we will never see the type of maturity, equipping, inter-dependency, sacrificial love, support, and mutual edification that Paul describes in the New Testament. The people will always function as laity and the pastors as clergy and we will fall short of the New Testament pattern that the Reformers fell short in. That is their ecclecisology. If we are to lead like, Christ, Paul, Peter and John, if we as older men and women will be able to use terms such as “as a father or mother” or “my beloved children” or “my dear children” then it will take relationships. Us opening our homes and our lives. Allowing those we lead to see us function as human beings not as “clerical robots” saying the right things at the right time. If our relationships are outside of the body that we are “called” to lead then all we become is CEO’s, Presidents, Offices and never brothers and sisters and that misses what the New Testament and our Master calls us to. Is Anyone Called to The Pastorate? 1. Is anyone “called” to the ministry as the phrase is commonly used? 2. Is there a difference between a pastor and an elder? (this will cause us to examine Ephesians 4:11 and 1 Peter 5 in concert). 3. Given what Paul writes for qualifications what exactly is the first prerequisite? 4. Why do we believe that “pastoring” is a “special” calling instead of an aspiration? 5. Finally does this effect our ecclesiology at all? Derrick and Michael (MSAMU) have been talking quite a bit on this issue and I wanted to provide them a platform to express their ideas. I don’t know what you guys believe about Ephesians 4:11 but I have seen you both quote it quite a bit. To those who carry the title of pastor do you feel that you were called or that this was something you aspired to? Alan if you around I would love your take on this. I am sure you have written on it before. Lance and Joe you guys have been gracious and detailed in your perspective hopefully this will help us keep the conversation going. Hutch you have been giving me fresh eyes on this so I know you have a bunch to add. This should be enjoyable. Now any takers?